Over the last 18 months, we’ve been participating in a groundbreaking experience design project for young cancer patients, led by digital innovation agency Corporation Pop. 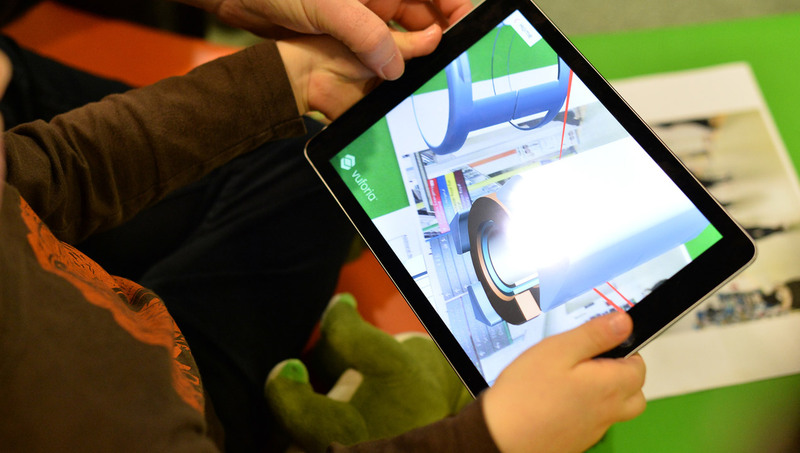 The project uses augmented reality (AR) and artificial intelligence (AI) in an app that improves child patient experiences by giving them access to a wide range of information resources to reduce their stress and anxiety, and in doing so, contribute to better treatment outcomes. Medical care represents a complex end-to-end process from diagnosis to recovery, and understanding patient experiences relies on capturing their needs at many different stages within their service user journey. At each stage, patient experiences are also defined by the interactions of groups of different people around them, as well as the patient’s own personal needs. There’s a clear need for a collaborative design approach to patient experience design projects, because designing better patient experiences relies on the input of many different groups involved within a care pathway, i.e. patients, clinicians, friends, family members and support workers. Here are some of the key insights we’ve uncovered working with Corporation Pop on this project, revealing how both clinical and non-clinical factors shape the overall patient experience, and demonstrating that when it comes to patient experience design there is no one-size-fits-all but there are a number of best practice approaches to deliver better patient outcomes. After his daughter Issy was diagnosed with a rare form of bone cancer in 2011, Dom Raban (Corporation Pop’s managing director) found there was a significant lack of information for parents and children faced with long-term cancer treatment. His daughter’s experiences were characterized by a lack of appropriate information for her age – with resources either being designed for much younger children or adults – and this meant she didn’t know what to expect from treatment. What information there was, was directed at us as parents, which left my daughter feeling isolated and ignored. She was resistant to treatments because their purpose wasn’t explained to her beforehand and she was scared of going to hospital as she didn’t know what to expect. After researching child patient information needs, Dom discovered this was a common problem. Studies showed that providing children with better information not only improved patient experiences but also had a positive effect on treatment outcomes, so Dom started an experience design project that resulted in an mobile app to support childhood cancer patients. 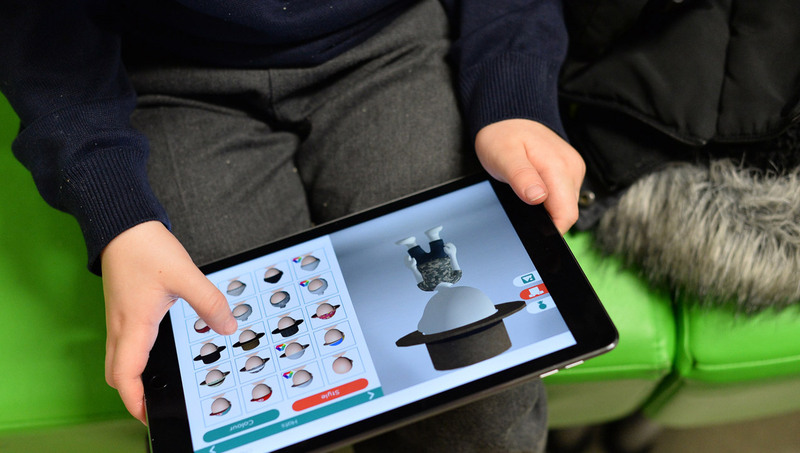 It uses games, AI chatbots and augmented reality (AR) to explain cancer treatments in an engaging way designed specifically for children, but creating the app revealed a number of insights into how to improve patient experiences more generally through technology. These broader insights demonstrate how important it is to collaborate with users and in doing so, learn how patient needs evolve and change throughout treatment. If you’re designing an extreme surfing holiday experience, you’re unlikely to consider the elderly as a core demographic in your design research. Or, if you’re studying customer journeys for beard grooming products, you don’t need to focus on pre-teen children… and so on. There’s usually an intuitive contextual scope for customer experience design projects, but less so when it comes to designing patient experiences. Anybody can be a patient, and almost everybody is at some point. Understanding the fears and expectations of healthy people is important for designing better patient experiences. Everyone naturally has a degree of anxiety about illness and expectations of medical care, and these ‘healthy’ attitudes play an important role in how we experience treatment when we’re unwell. Corporation Pop began by working with a group of healthy 14-15 year olds to capture their expectations of treatment within a hospital, and design solutions collaboratively with them. A number of those initial ideas now feature in the finished suite of apps, proving that everyone can play a valuable part in patient experience design. You don’t need to be a patient so much as part of the care pathway demographic to offer useful insights into improving experiences. The problem with patient surveys is they only capture a narrow slice of the overall experience. In the patient context, their viewpoint is naturally limited to their personal journey which is affected by all kinds of external factors they might be unaware of, or the survey isn’t designed to capture. They gave my daughter a typical patient survey, and one of the questions was would you recommend this service to friends and family. Nobody would recommend chemotherapy to friends and family, would they? Patient experiences are shaped by a wide range of factors, from the experience of friends and family visiting in hospital, to the experiences of clinical staff managing treatment plans, and charity support workers engaged in wellbeing programmes for patients and carers. It’s also important to study the way groups associated with patients interact with each other, because these groups can highlight patient needs that might otherwise remain undiscovered. Oncology outpatient waiting rooms build social bridges where groups of parents share experiences and support each other, but that social function is often missing for patients because they’re undergoing treatment. Building social bridges for peer support is a clear patient need, but it’s the kind of insight you can’t get from a survey because the patients aren’t necessarily aware they need it. Ethnographic observations of the whole outpatient process reveal insights survey techniques don’t capture. Mapping the patient journey, especially for long-term treatments, shows how patient needs change during the course of their treatment, and understanding those changes are essential for effective experience design. When you’re first diagnosed with cancer, there’s a huge amount of information to take on board and treatment is a strange, often frightening experience. After ten sessions of chemotherapy, you’re what we call a professionally engaged user, familiar with the process but challenged by managing side effects or understanding your treatment progress. Patient experience apps need to match the patient journey, evolving to meet changing needs within the care pathway. Diagnosis: Comes after referral by a family doctor (a familiar experience) to a specialist, or series of specialists (unfamiliar experience). It introduces the patient to a whole new vocabulary of terms (unfamiliar and confusing), and usually leads to a stay in hospital (unfamiliar location). Hospitalisation: The vocabulary and role of specialists becomes more familiar. At this point, the patient’s information needs shift to understanding recovery from surgeries and medical interventions, and the experiences of care within a hospital environment (orientation with ward experiences, building social connections with peers, friends and family visiting, maintaining connections with outside world such as school work and so on). Outpatient treatment: Relatively uncontained, being outside the acquired familiarity of the hospital environment. This represents another shift, losing the familiar routines of the hospital, and the peer connections made in the ward. Additionally, depending on the type of treatment this could also include relocation to a new city or and sometimes even treatment in another country, which presents a raft of new information needs to do with orientation with an unfamiliar environment. We studied patients who build bonds and make friends on the ward, then suddenly lose those social connections because their treatment moves into a new phase and they transition to outpatient pathways. Supporting patients – especially children – through that experience is important to reduce the emotional stress of long term treatment. There’s a compelling case to be made for studying the end-to-end patient journey to understand these non-clinical but emotionally critical issues. One final insight into the process has been the need to remain ‘tech agnostic’ throughout, and select the best-fit technology to support the patient at each different stage of the journey. The app uses games, AR and AI chat but these technologies were selected after the research, as the best tools to meet the requirements of the project. Although this project has focused on the experiences of teen cancer patients and Corporation Pop are already working to develop versions of the app for children with other conditions, there are a number of clear insights that apply much more broadly to all long-term care patients: The need to capture the fears and expectations of healthy people; the need to map the patient journey throughout the care pathway; the need to study the experiences of friends and family, medics and support workers within the pathway; and the need to select technologies specifically to meet the patient’s needs. The users are always collaborating with us. By using the app, they give us vital data about how to improve its design, and we’ve built a group of people to feed into that process, from oncologists to the cancer charities, the NHS, parents and educators. It’s the only way to get a 360 degree, rich insight into the care pathway, which is essential if you really want to understand the patient experience. 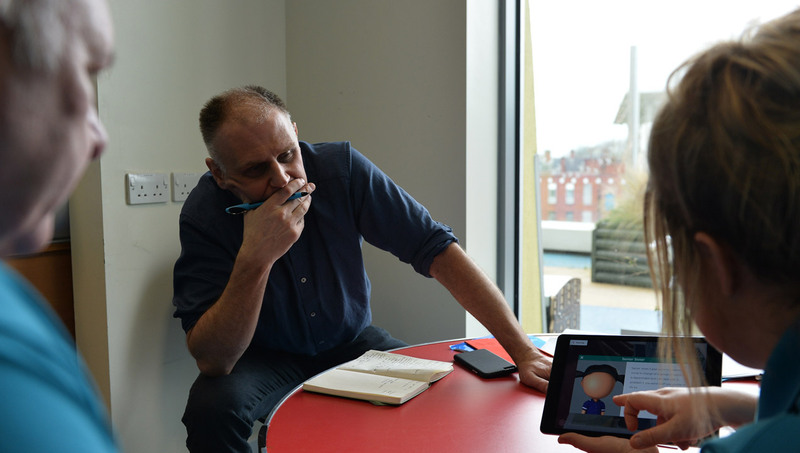 As the project enters its next phase, designing an experience app for patients at other hospitals, the learnings from the project so far underscore the critical importance of collaboration in patient experience design. Which feels appropriate, because patient experiences are by their nature, collaborative experiences to begin with.